Around the world, June 8 is recognized as World Oceans Day. It’s a time to celebrate and honor our oceans as a resource that connects everyone. It’s also a time to commit to keeping them clean and healthy for the animals who call them home and the people who rely on them. Cleaning up our oceans sounds like an enormous task, but there are simple things you can do today to transform our oceans so that they can remain a healthy home and valuable resource for generations to come. Keep reading for a few easy ways you can update your daily habitats to make waves of change for the ocean. And, learn more about several highly-rated charities that are working “on the water” to clean up and protect our oceans and waterways, and improve access to clean water for communities around the world. The health of our oceans affects the creatures who live in them, as well as every human being. For those of us who live on the shoreline or enjoy a summer trip to the beach, we can appreciate the beauty, magnitude, and possibility of the ocean. But what about people who live inland? How does the ocean shape their lives? Did you know the oceans are responsible for regulating our climate and generating most of the oxygen we breathe? Additionally, they provide food and naturally clean the water we drink. It doesn’t matter where we live--the oceans affect us all. Just like a healthy ocean means a healthy environment, a dirty ocean means and unhealthy habitat for marine life under the sea and human life above it. 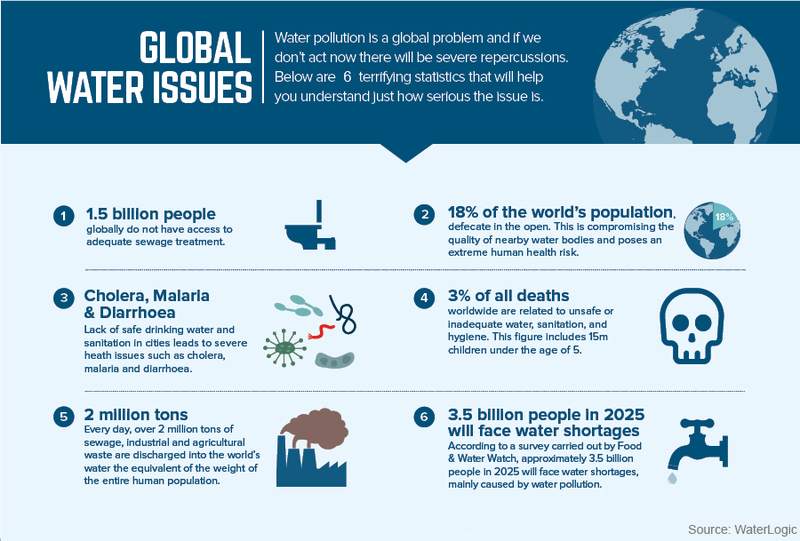 Our friends at Waterlogic put together an infographic detailing some pretty scary facts about our global waters and growing water issues. We’re sharing 6 of them here. You can access the full document that breaks out water issues by continent on their website. Pretty scary, huh? Luckily, there are simple things you can do today to help keep our oceans clean and contribute to the global health of our blue planet. Implementing a few of these things can have a huge impact on our ocean and communities around the world. Throw that trash away. Perhaps the easiest way to keep our oceans clean and healthy is throw trash away in a garbage or recycling bin. Litter can land in our oceans negatively affecting the marine life who lives in them. Reduce your plastic usage. In addition to throwing away and recycling trash, working to reduce your overall plastic consumption will have a huge impact on the health of our streams, rivers, and oceans. Unlike other materials, plastic does not biodegrade which means it can go on to negatively affect our waterways and marine life for generations. Dispose of household items correctly. Oil-based paints, household chemical compounds, and non-degradable products can pollute our water source. Never dispose of these items at home in the sink or toilet. Contact your town, they may offer drop-off locations for these items. Join a beach clean up. If you live on the coast, consider getting involved in a beach clean up project. Not only do these projects keep our beaches clean for summer visitors, but they prevent trash and litter from finding their way into our oceans. Do your research. Learn more about the oceans and the creatures who call them home. Gaining an understanding of just how powerful the oceans are, and what kind of unique wildlife they house will make protecting them even more meaningful. In addition to making small changes to your daily habits, consider supporting an outstanding organization working on ocean conservancy and water security. We’re talking about a few of them here, but you can find many more at www.charitynavigator.org. In the late 1990s, a study found that less than 1% of resources spent by environmental groups were going to ocean conservancy. Oceana was founded as a result. It is an international organization focused solely on oceans, dedicated to achieving measurable change by conducting specific, science-based campaigns with fixed deadlines and articulated goals. Additionally, Oceana’s legal arm has won almost 200 victories for our ocean and protected more than 3.5 million square miles of our oceans. The Ocean Foundation is a unique community foundation with a mission to support, strengthen, and promote organizations dedicated to reversing the trend of destruction of ocean environments around the world. The Foundation works with donors to grow financial resources to support marine conservation in order to promote healthy ocean ecosystems, and benefit the human communities that depend on them. Since 1972, the Ocean Conservancy has been advocating for the wildlife who call the ocean home. In early years their work focused on species like whales, seals, and sea turtles. Over time they have grown into a science-based organization that stands on the conviction that every human can make a positive difference for our oceans. They are committed to working with experts and individuals to seek solutions for a healthy ocean and the wildlife and communities that depend on them. Just like marine animals require a clean ocean to survive, so do humans. According to the UN, more than 40% of the world’s population lives on continental coastlines. These people rely on directly on the water for their livelihoods. When ocean health is compromised, so is there ability to work, and access food and water. Inland communities are also affected when dirty ocean water mixes with their rivers and streams, and affects the overall health of our global climate. Organizations like Food and Water Watch and Safe Water Network work with communities around the world to build infrastructure to ensure people and families have access to clean drinking water. As their mission says, Food and Water Watch champions healthy food and clean water for all. They stand up to corporations that put profits before people, and advocate for a democracy that improves people’s lives and protects the environment. They are working toward a healthier future for families and future generations--a world where all people have the resources they need, including wholesome food, clean water, and sustainable energy. 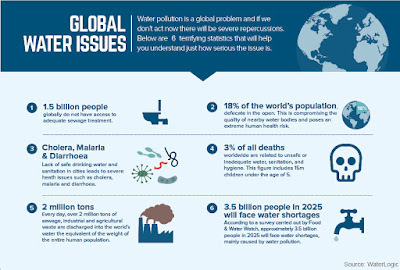 More than a billion people around the world lack access to safe water. Join us in advancing market-based solutions. Co-founded by Paul Newman, Safe Water Network envisions a world with healthy, thriving communities, each managing its own sustainable supply of safe water. Their mission is to develop and demonstrate affordable, economically viable solutions, to share sector knowledge, and to build partnerships that reach millions of people in need. They achieve this by working with the communities they serve to develop solutions and build on a growing body of work and research. These are just a few of the highly-rated charities working to protect our oceans, the animals who call them home, and the people who rely on them. 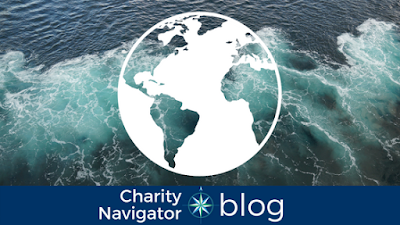 You can use Charity Navigator’s Advanced Search Tool and Discover feature to find even more organizations working on ocean conservancy and water security issues. Now that you’ve got a few ideas on how to make small changes to help our oceans, as well as a list of outstanding organizations that are hard at work “on the water” to clean them up, you’re ready to go! How are you going to make waves to protect our oceans? I appreciate your help, Charity Navigator. I am a senior living on a limited income. I donate to animal welfare charities by in large and I make donations to you, CN, because of the work you do to research and inform. I wish you could cover smaller charities because many of them do so much good with so little. Thank you!